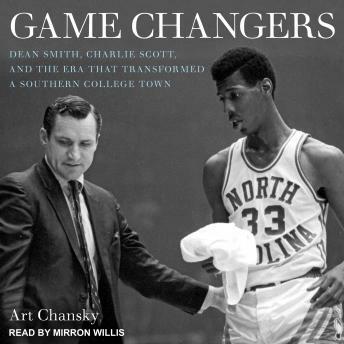 Among many legendary episodes from the life and career of men's basketball coach Dean Smith, few loom as large as his recruitment of Charlie Scott, the first African American scholarship athlete at the University of North Carolina at Chapel Hill. Drawn together by college basketball in a time of momentous change, Smith and Scott helped transform a university, a community, and the racial landscape of sports in the South. But there is much more to this story than is commonly told. In Game Changers, Art Chansky reveals an intense saga of race, college sport, and small-town politics. At the center were two young men, Scott and Smith, both destined for greatness but struggling through challenges on and off the court, among them the storms of civil rights protest and the painfully slow integration of a Chapel Hill far less progressive than its reputation today might suggest. Drawing on extensive personal interviews and a variety of other sources, Chansky takes readers beyond the basketball court to highlight the community that supported Smith and Scott during these demanding years, from assistant basketball coach John Lotz to influential pastor the Reverend Robert Seymour to pioneering African American mayor Howard Lee.